Summer doesn't truly start in Seattle until July but with warm weather and cool breeze at nights, it has been a wonderful week so far in Seattle.With warn weather comes barbeques, swimming and lemonades to enjoy the sunny weather out here. Cucumbers are a great refreshing summer treat and I have used them in salads or had them with just salt & pepper. 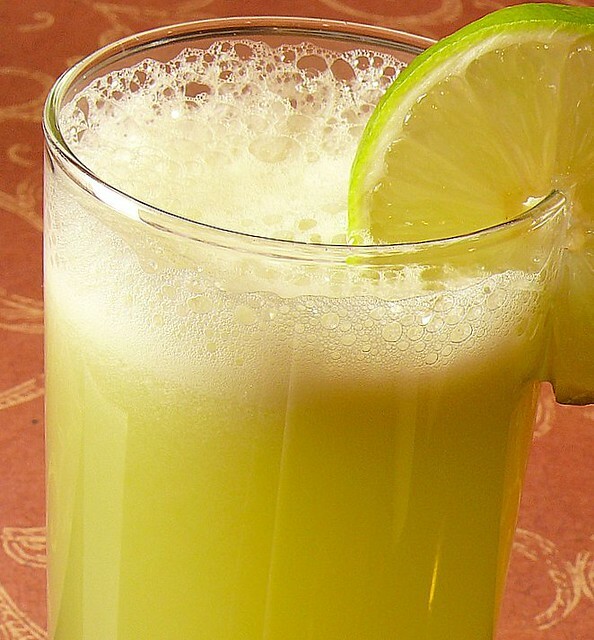 Today`s Cucumber Lemonade recipe is an attempt at trying cucumber and lime together~ a cold frothy concoction for a warm evening. In a blender, combine cucumber,lime juice, water and sugar. Puree until frothy and serve chilled with few ice cubes. Garnish with lime wedges. Looks delicious. I am waiting for a warm one. cucumber lemonade really a refreshing one..
love the color..so refreshing ..and healthy drink..
Wow very unique and healthy cooler for the summer. Will try to make this drink. I have not tried making a drink with cucumber. I too tried this long time back,forgot after that! Nice drink to refresh! Wat a refreshing lemonade, prefect thirsty quencher.. Sounds great, love the color. Perfect summer drink. Looks wonderful! lovely combo and refreshing drink. Very innovative drink.Sounds wonderful and refreshing. Btw, Cilantro, did you strain after blending or directly poured them in glasses? I did not strain the juice, pureed and poured into glasses and chilled. I will definitely try the chilled soup. Something so different and I bet very soothing! I was thinking of the cold cucumber soup during the past few days the temp went up to the late 80's.. this would have been perfect. Thats very unique lemonade and full of flavors! Anything with cucumber gets a thums up in our house. This is going to be one refreshing drink for the upcoming summer. pic looks gr8.Love to have this refreshing chiller now. you have a nice collection of refreshers.... btw just realized you are also from Seattle...Super glad to find another blogger in the neighbourhood. We live in the east side. Great combination, looks refreshing and inviting! Wow that looks delicious and healthy! will definitely try it out. Thanks.